As the Accidental Naturalist, I couldn't resist writing about this particular award recently given to my cousin, Marietta McCarty, for her new book How Philososphy Can Save Your Life: Ten Ideas That Matter Most (Tarcher/Penguin, 2009). Since I taught her everything she knows (despite the fact that she is a wee bit older), I share her joy but none of the royalties. This system seems to work for us. The Nautilus Awards recognizes books and audio books that "promote spiritual growth, conscious living, and positive social change while at the same time they stimulate the imagination and offer the reader new possibilities for a better life and a better world." It's a tall order, but my cousin has filled it with her chapters on Simplicity, Communication, Perspective, Flexibility, Empathy, Individuality, Belonging, Serenity, Possibility, and Joy. Each of these concepts is discussed in the context of two different philosphers (Epicurus, Socrates, Martin Luther King, Jr., the Dalai Lama, Albert Camus, Lao Tzu, Rita Maning, Simone de Beauvoir, Alan Watts to name some of the twenty). This is a book to be used, not read and then set on the bedside table. McCarty has included discussion questions, homework (reciting, reading, writing, and other activities), as well as an expansive list of music, poetry, prose, drama, and documentaries to help readers approach each concept from a myriad angles. In the Perspectives chapter, for instance, McCarty encourages you to listen to Janis Joplin's "Me and Bobby McGee," Ella Fitzgerald's "Don't Fence Me In," Antonio Estevez' "The One Who Sang with the Devil," and Bing Crosby's version of "Ac-Cent-Tchu-Ate the Positive." Does philosophy get any better than this? Could anyone have a cousin with more eclectic taste? What would Plato think? The living nautilus, by the way, belongs to a family of marine creatures called cephalopods (octopuses and squid are in this family). 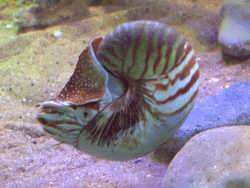 The nautilis is the only cephalopod species whose bony body structure is externalized as a shell. Because this animal grows into increasing numbers of chambers within its shell, it has become a symbol for expansion and renewal. What a perfect symbol for a philosophy book! In "how philosophy can save your life", "marietta mccarty", "nautilus awards"